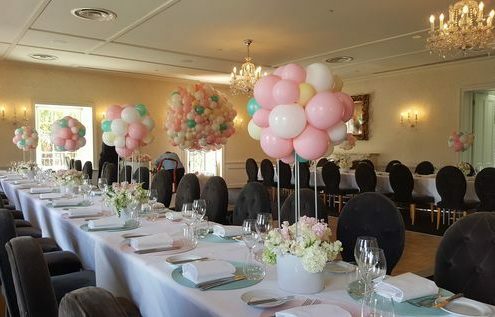 Ranging from small and simple to tall and elegant, air filled table centres can be styled to suit any event and effortlessly add coherence and structure to a space. 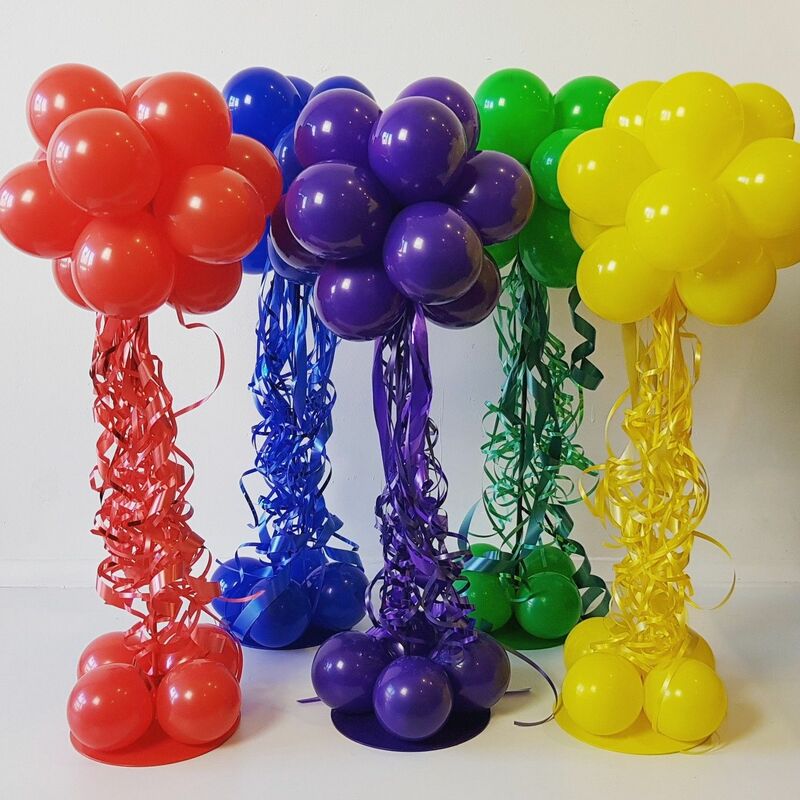 As they are air-inflated they are also better for outdoor use and are long-lasting so can be set up the day prior to your event. 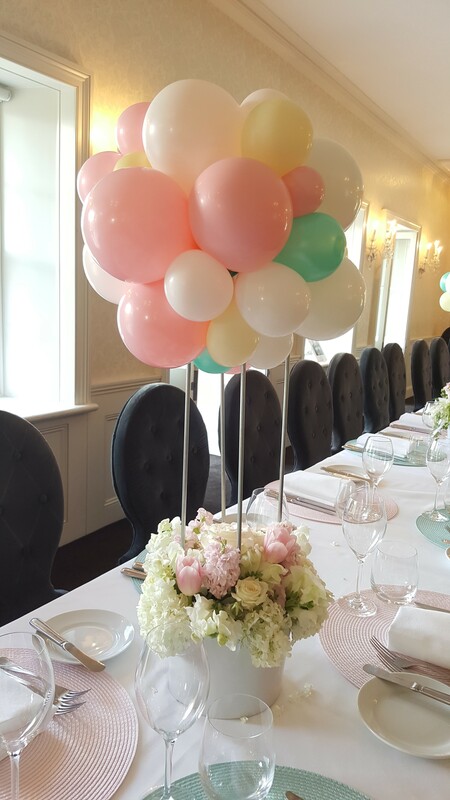 Air filled table centres are a great way to style your event, adding texture and colour to each table with a variety of cute, fun and elegant designs! 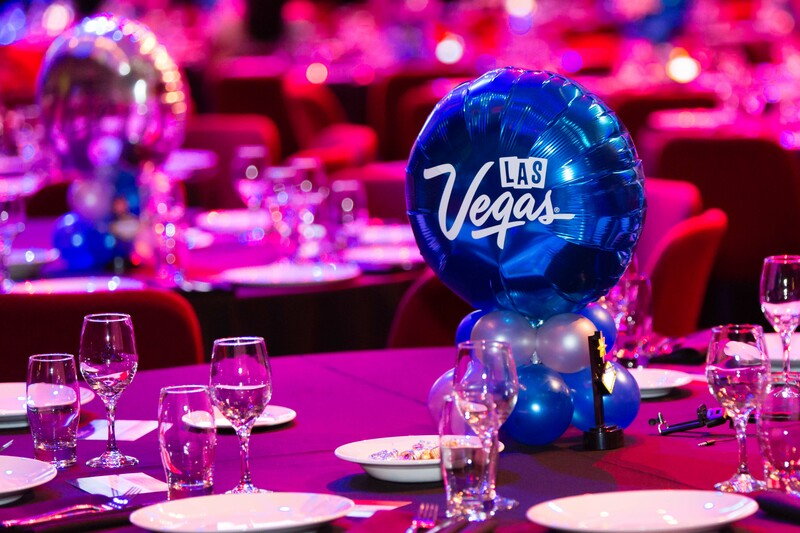 With the ability to choose from a selection of latex colours, they can be customised to suit any event. 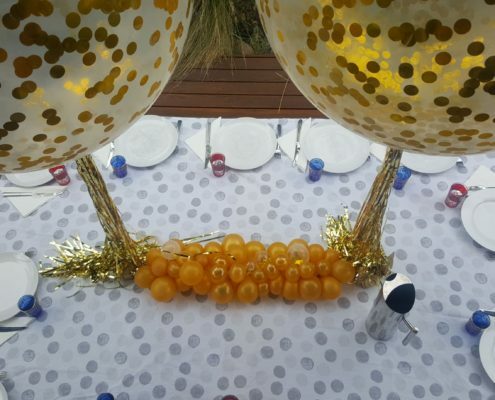 Table spangles are a smaller option for styling your tables. 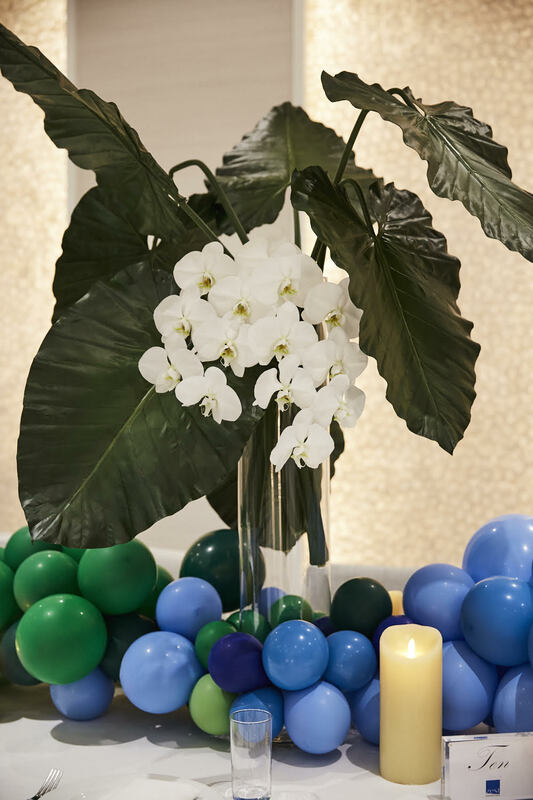 These little arrangements are built around a small sandbag with colourful metallic sprays. 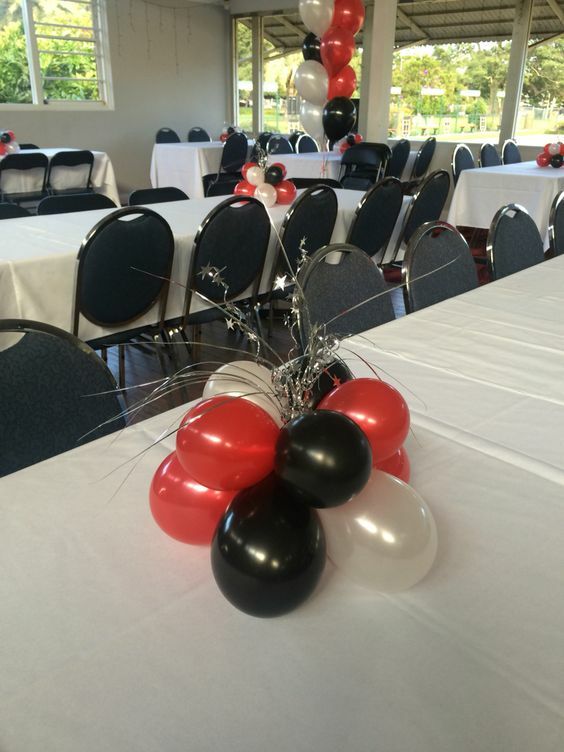 They are elegant and perfect for any celebration – whether it be a formal dinner or a corporate function. 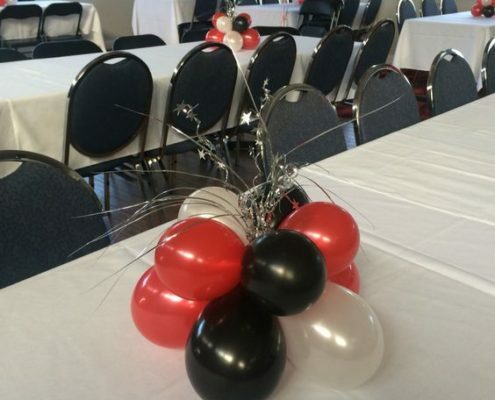 They sit low on the table so that they don’t obstruct the view across the table or around the room. 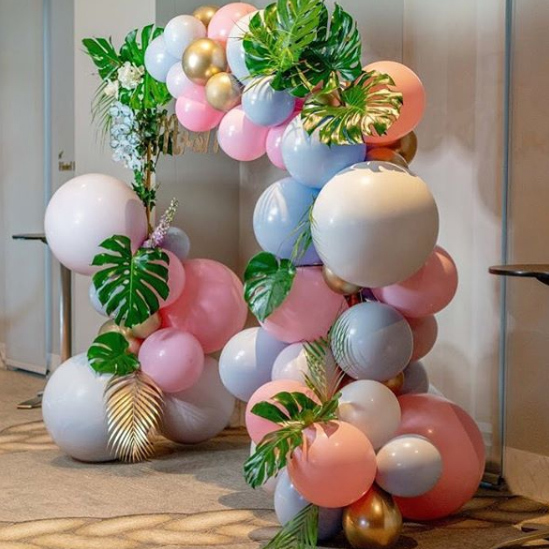 This is great for conferences or Weddings where a visual view from everyone in the room is essential. 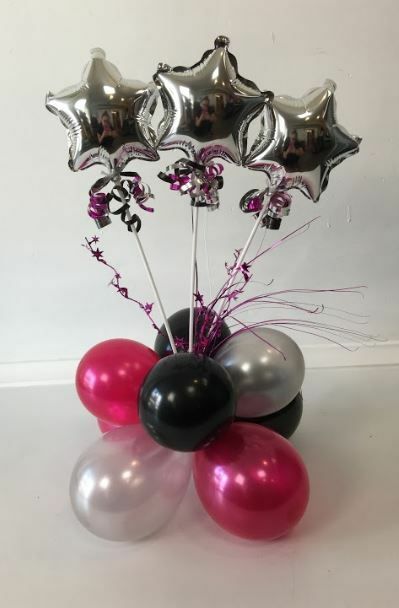 We can also add extra details to them such as 7″ foil stars and metallic numbers so that they better suit the party theme. 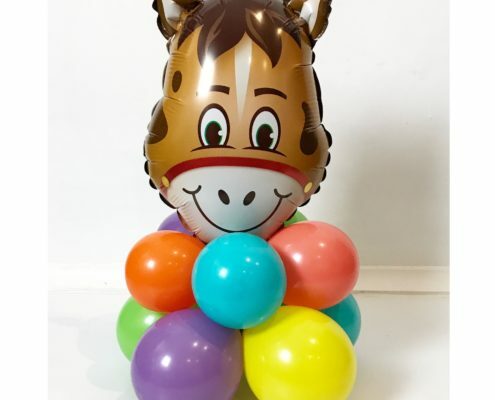 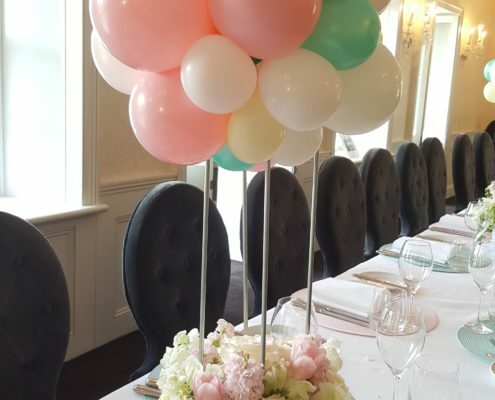 Table Posies are a lovely centrepiece consisting of small 5″ balloons around a small weight to create a perfect base to highlight the feature 11″ balloon. 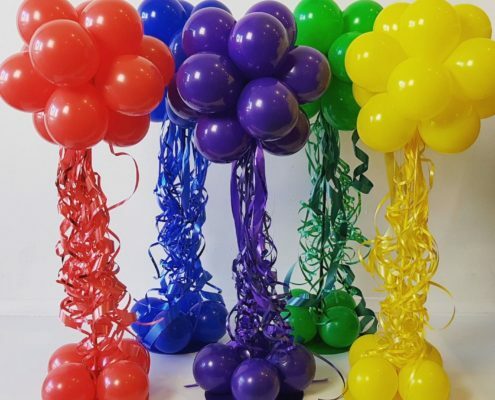 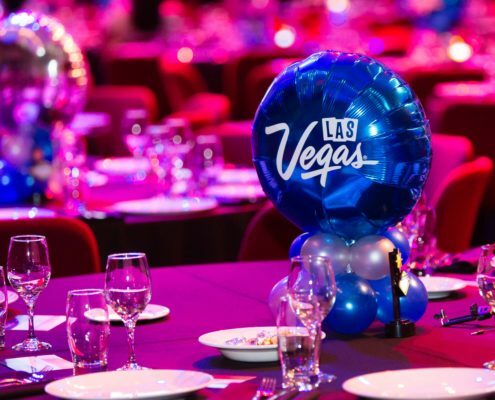 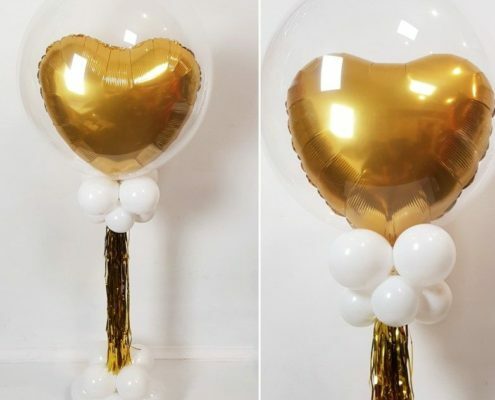 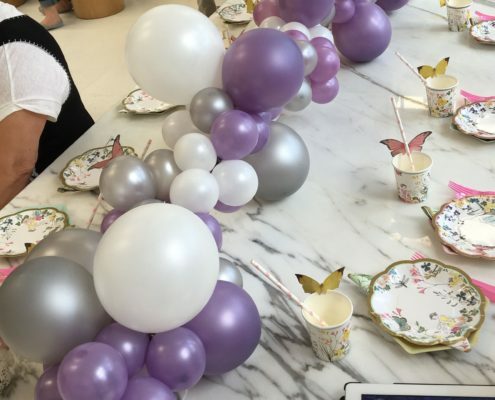 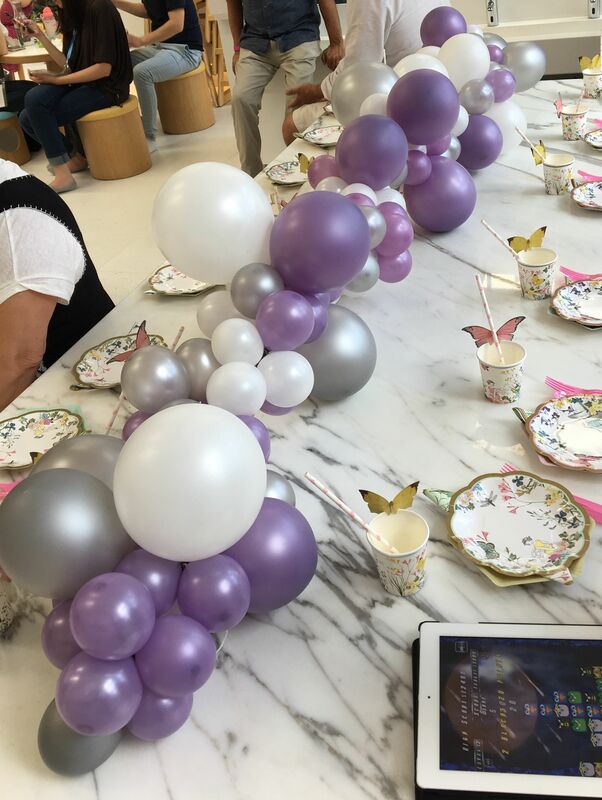 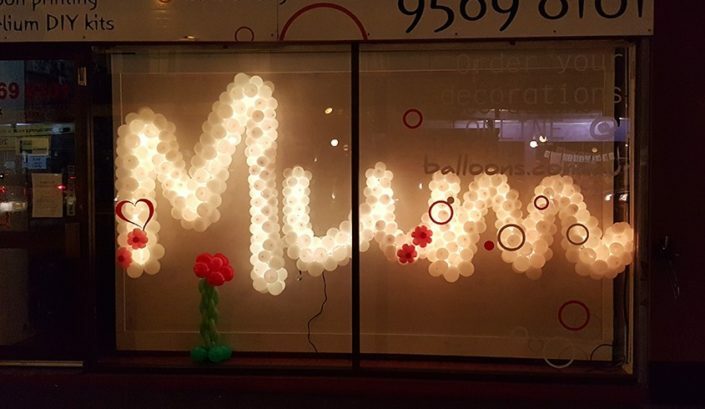 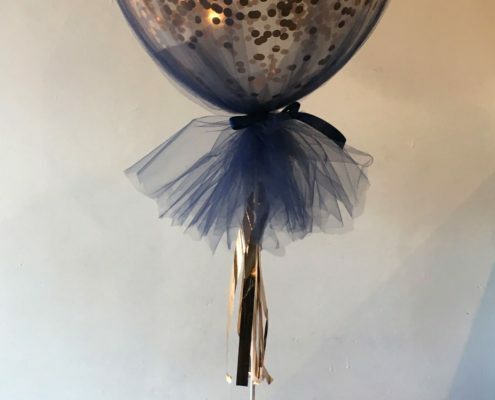 Customise your posie by adding a printed 11″ balloon on top to reflect the party theme! 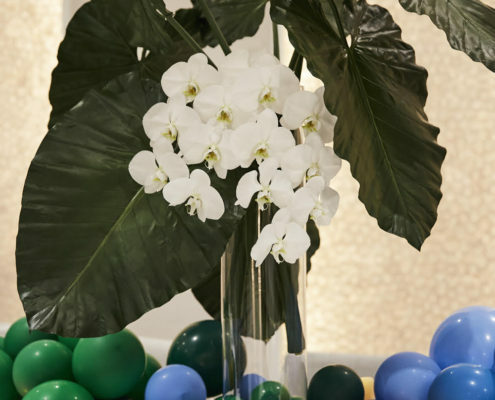 Otherwise, style your spangles and posies through cool colour combinations and extra details. 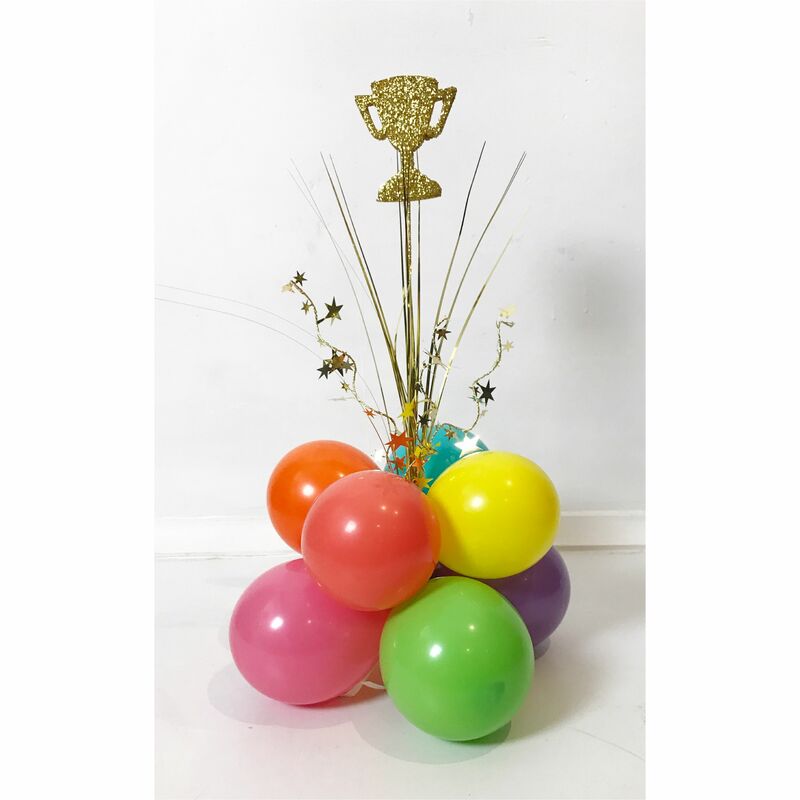 Below are examples of our Melbourne Cup table spangle and posie! 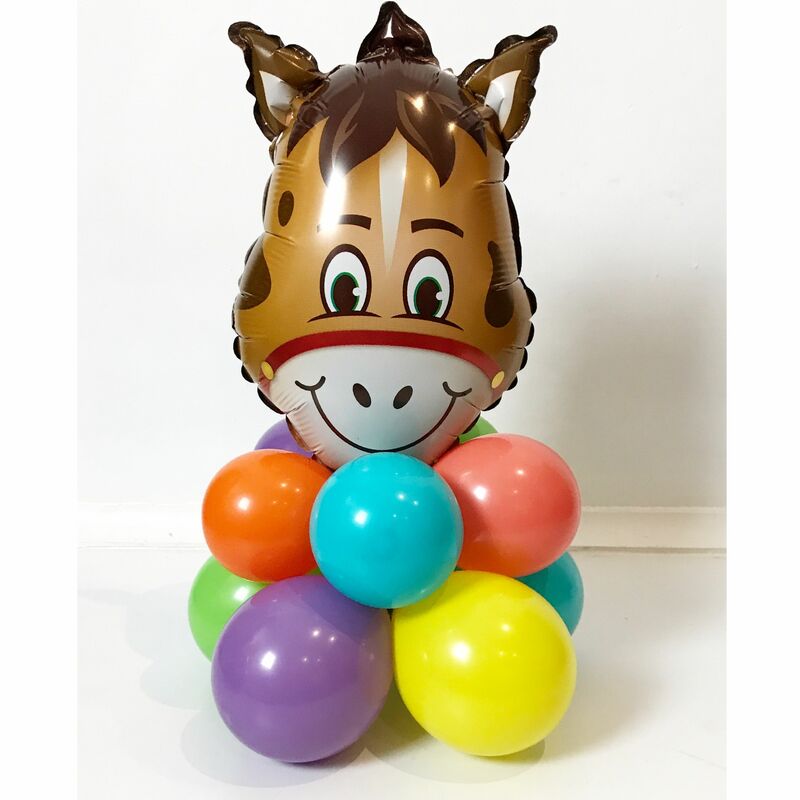 If you want your posies to be customised specific to your event then check out our balloon printing page. 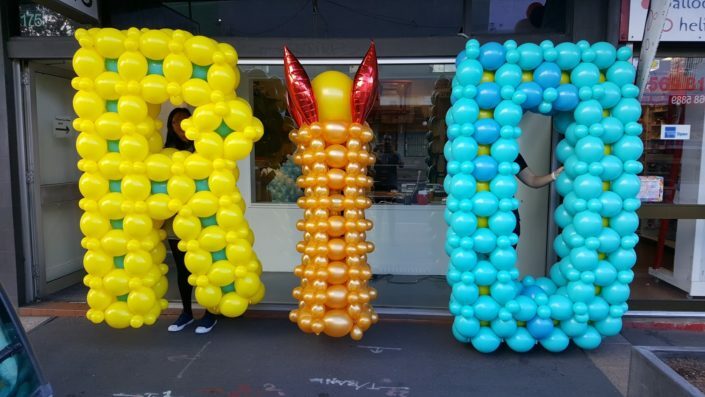 It is a great way to promote and celebrate your brand and makes the event that much more unique! 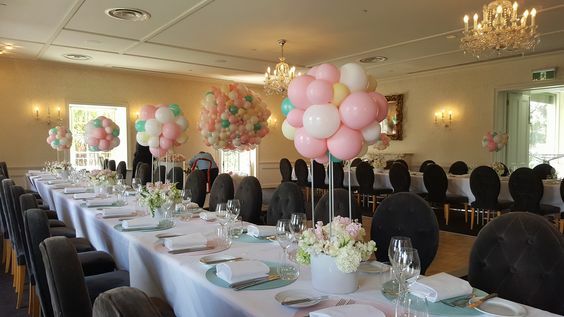 Topiary Trees are also a great way to style your space using air filled balloons. 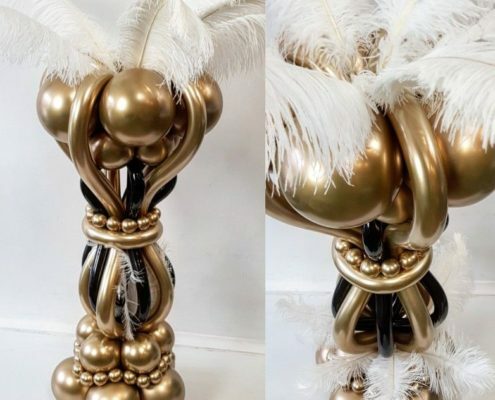 Standing approx 60cm tall these classic table centerpieces are a great way to add colour and theme to your event without overpowering your table. 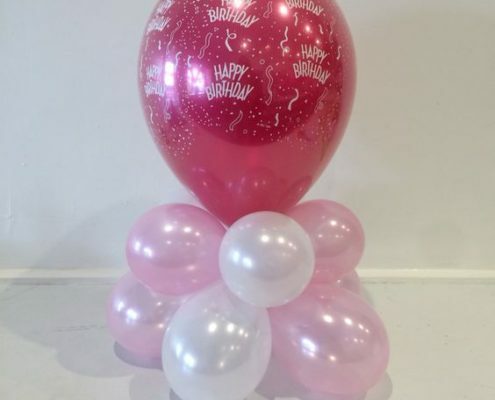 The main body of balloons is self supported from the base layer of balloons and is made without the use of helium. 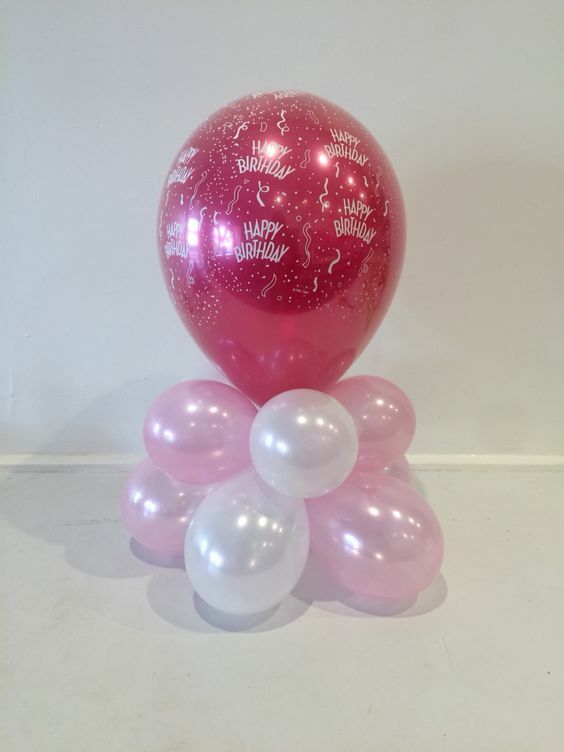 This design can last 1 week + and is suitable for indoor use or light weather outdoor use when treated with extra weight. 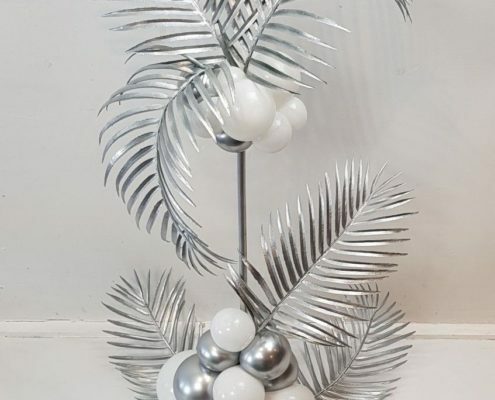 If you want something a little more dramatic then look no further than our Fantasy Tree table centres! 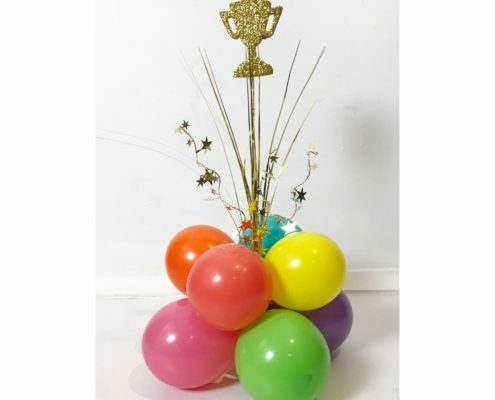 Standing at 80cm tall they are sure to add some height and detail to your event without taking up a lot of table space. 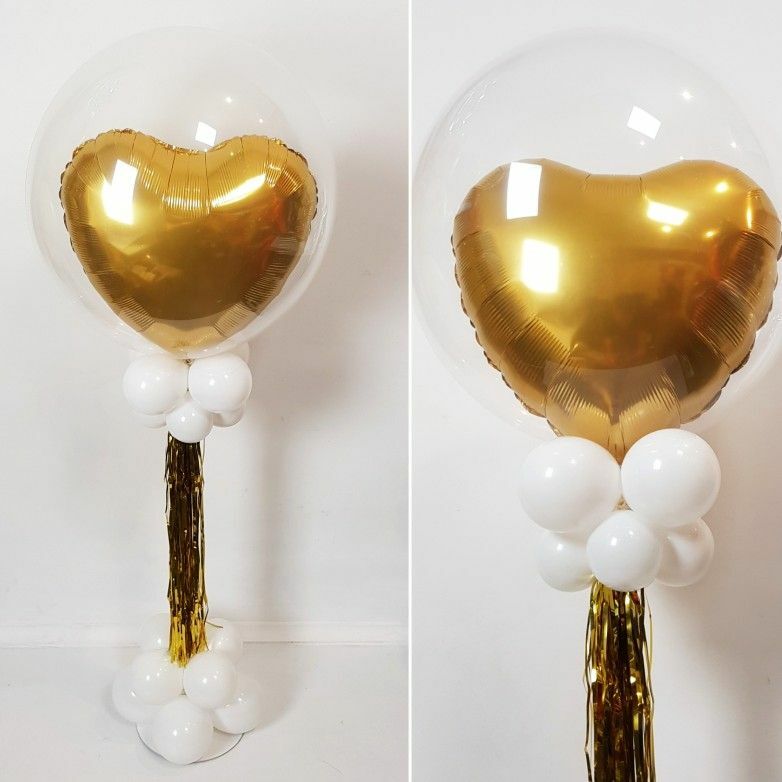 If you want something a little more elegant these also look incredible when paired with confetti, tulle or tassels, and look amazing as cake table decor. 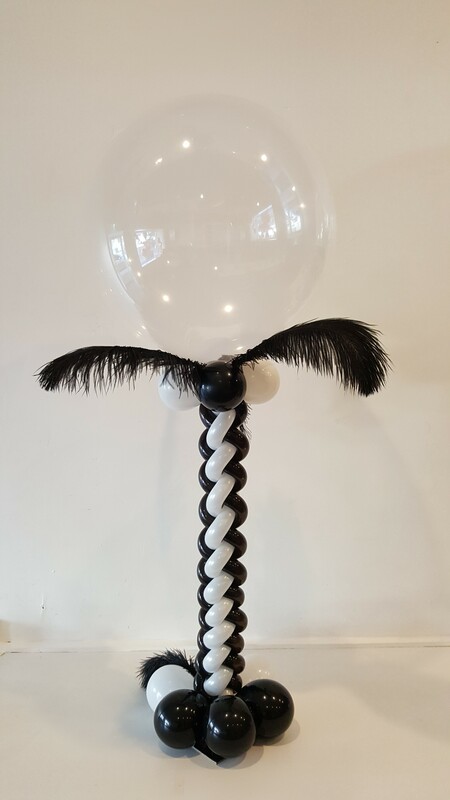 An incredibly cute and popular option is our Organic Hot air balloon table centres. 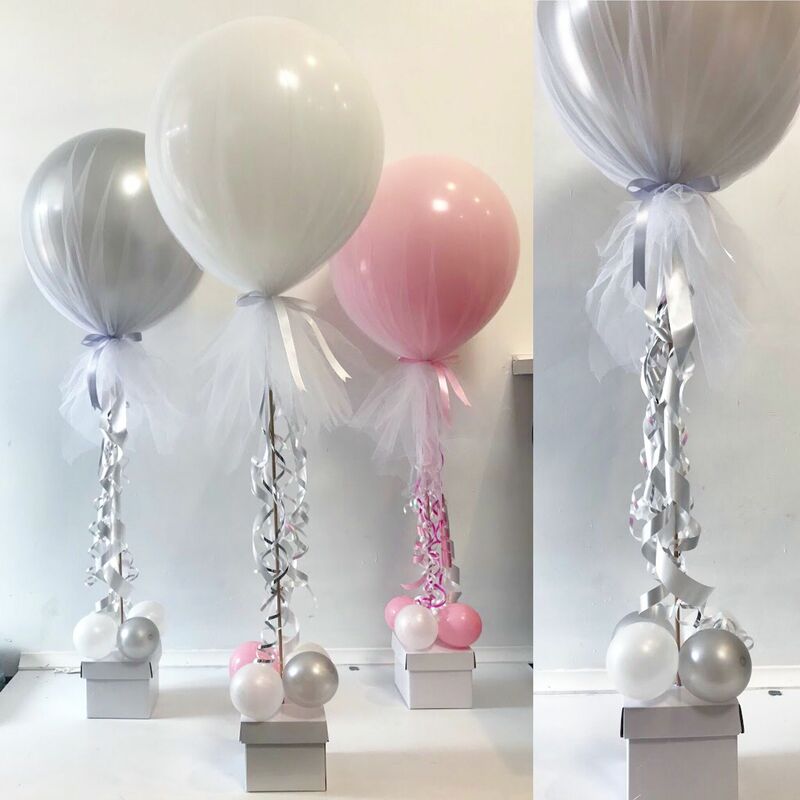 Perfect for birthdays, baby showers, christenings or even Weddings, these are sure to catch the eye and create a beautiful setting for your event. 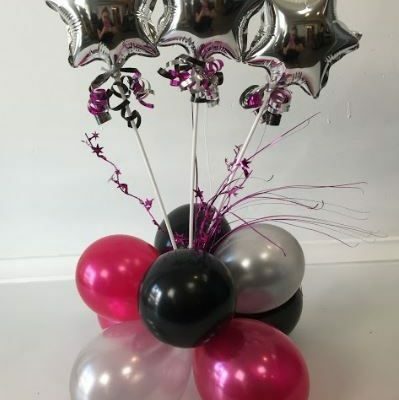 They also look great when paired with our Organic Hot air balloon Helium Arrangement or our Organic Hot air balloon sculpture! 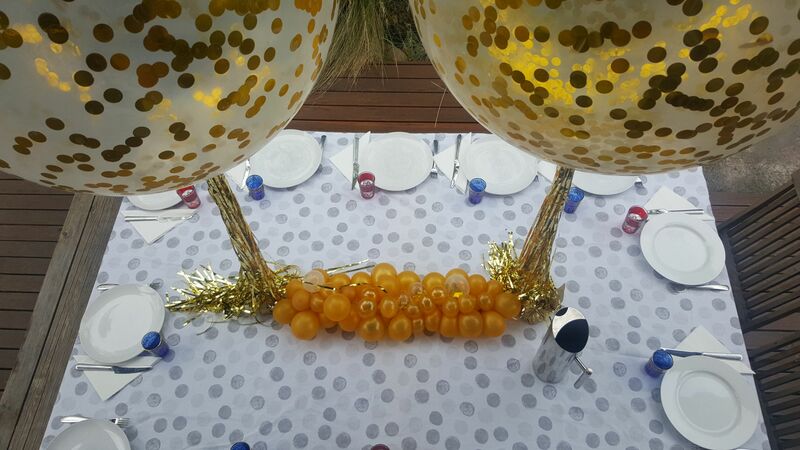 Another option for a table centre is a Table runner. 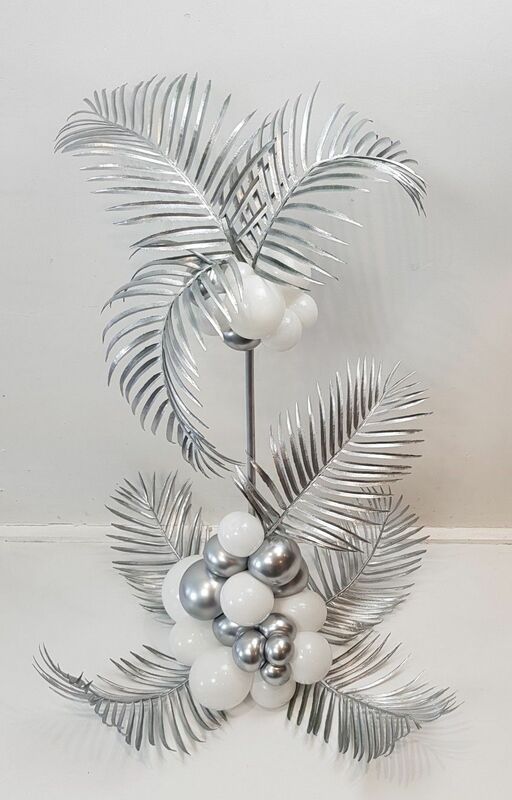 Available either in our organic style or as a custom design (like the pineapple inspired table runner below), they are a great way to make a focal point in the room or to style a long table. 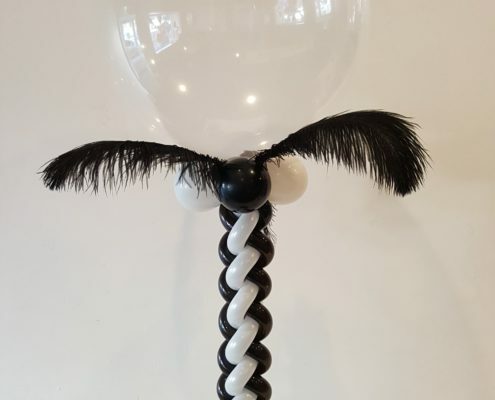 If you are planning a themed party or want something to be custom made then lucky for you we love to create new and exciting products! 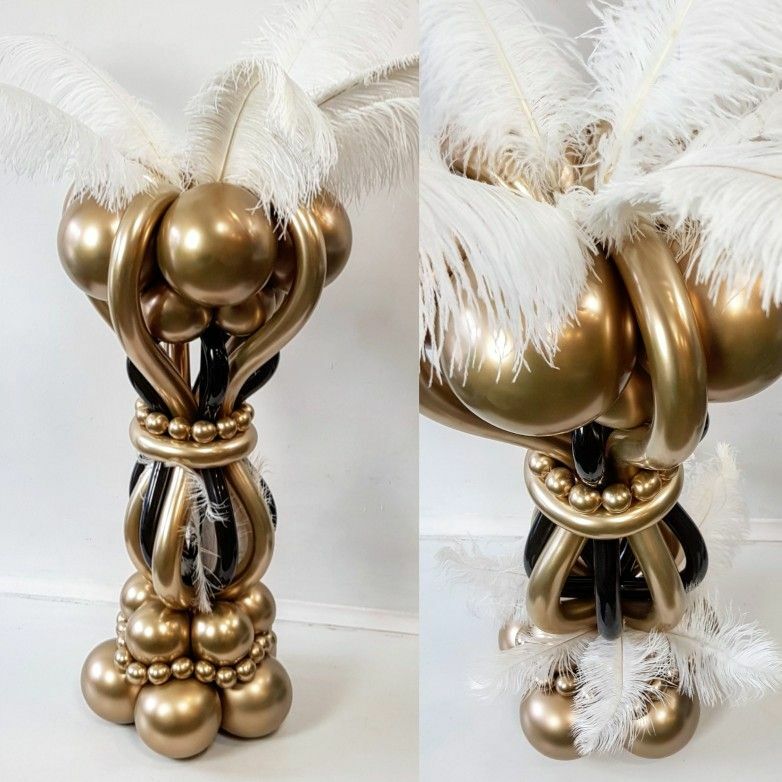 Our bespoke table centres have been some of our favourite work and we are always looking for a new project! 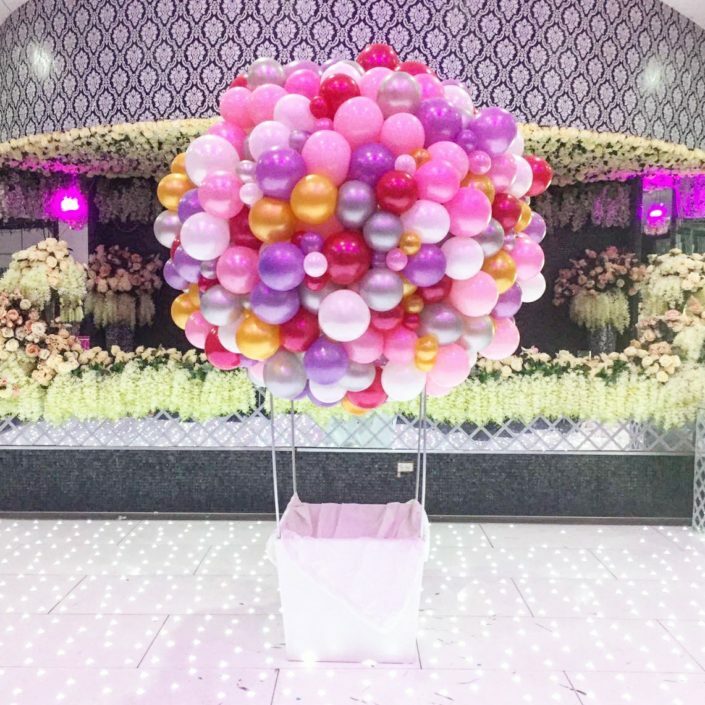 Send us an email with as much information as possible regarding your event and vision and we will get back to you with some options! 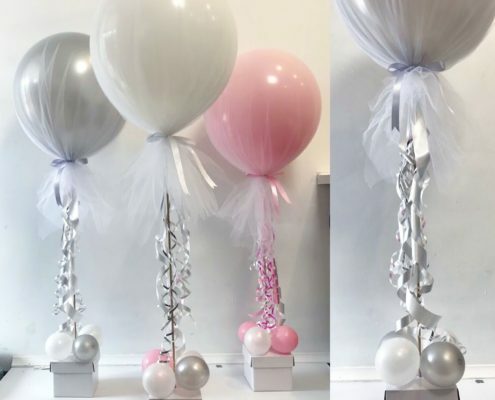 Below are examples of our Gatsby themed table centres, Wedding table centres and Valentines day table centres.